Generally speaking, Koreans love brisket. I know I do. Whether we slice it paper thin and grill it on an iron skillet (chadolbaegi), braise it in soy sauce broth (jangjorim), or use it as a base for a rich broth for soups, brisket is a beloved part of the Korean cuisine. Although the brisket can be tough because it’s a pretty well-worked cut of meat, it lends itself well to slow, long braises because of it’s relatively high fat content and marbling. This is precisely the reason why I decided to braise it in place of short ribs in a galbi jjim(Korean braised short ribs)-like dish. We spent the better part of the weekend doing our taxes. Oh joy. Why is it that tax laws/regulations seem to get more complicated every year? After finishing, my brain felt like limp noodles. I needed some replenishment for brain cells deplete and exhausted from the tax preparation. So I headed out to my local grocers to see what they had to offer. I really like the quality of the grass-fed beef that my local grocer/butcher sells; but often, I’m at the mercy of whatever cut of meat they have available. I had my heart set on short ribs for a braise or skirt steak for grilling, but they had neither. So I settled on the brisket in place of the short ribs. I prefer braises to grilled meats during the winter-ish weather. Additionally, I like the fact that you can control the fat intake in a small way by skimming off the fat (after cooling) if you choose to do so. Ooh~ And it worked out brilliantly. It was so tender and flavorful. It couldn’t have been better. And yes, it did replenish my brain cells. Added 5/28/2012: I made this over the weekend again. It is sooooo~ good. Just make sure to simmer it long enough for the meat to get very tender. Additionally, if you are watching your sodium intake, reduce the tamari by about 2 tablespoons. You can also use low-sodium tamari. Yum! Soak the cut brisket in cold water for about 30 minutes to an hour to draw out the blood. 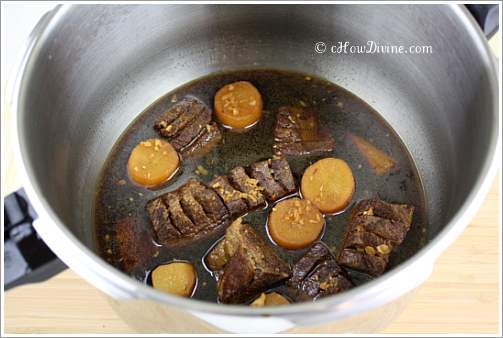 After soaking, discard the soaking water and place the brisket in a larger pot with a tight fitting lid. Add about 3 cups of water, 2 TB of mirin, 3 whole cloves of garlic, white part of green onions, and 1/4 onion. Bring the contents of the pot to a boil. Lower the heat to simmer and cover with a tight fitting lid. Allow it to simmer for about 45 minutes. Skim off any brown foam that floats to the top. Add additional water as necessary to replace any liquid lost through vaporization. While the brisket is simmering, stir together tamari, minced garlic, grated ginger, sesame oil, 2 TB of mirin, and agave nectar or sugar. Set aside. After 45 minutes have passed, discard the garlic, onion, and green onion using a slotted spoon. 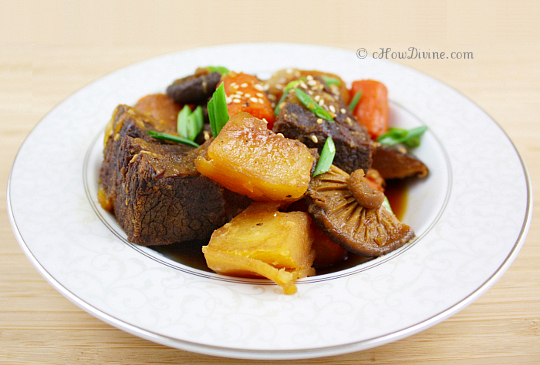 * Add the daikon pieces along with the marinade from step 2 to the broth and brisket. 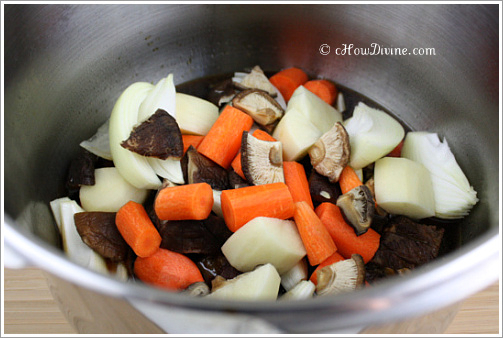 Cover, bring to boil, and continue to simmer for 30-45 minutes. 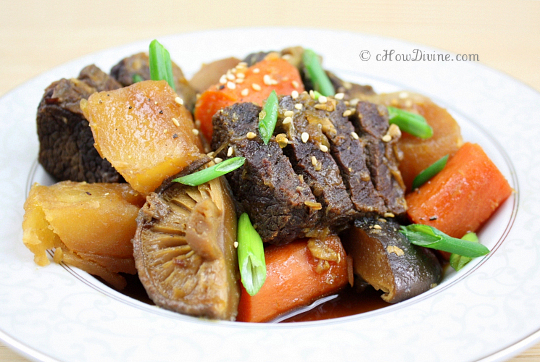 Stir in carrots, potatoes, onion wedges, and shiitake mushrooms. Cover and continue simmering for another 30 minutes. Uncover and allow it to simmer until the sauce reduces/thickens. Garnish with chopped green onions. Serve hot with steamed rice and kimchi. 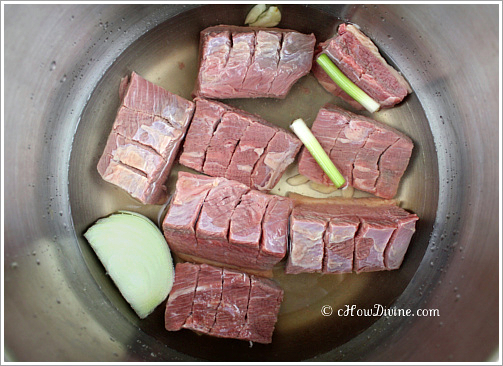 *If you choose to skim off the fat, you can remove the meat with the slotted spoon and cool the broth (before you add the daikons and marinade in step 3). Once cooled, you can remove the fat that hardens/floats at the top. Once the fat has been skimmed off, continue to follow instructions as written.